Stock prices rallied across the board yesterday, with the Dow Jones Industrial Average advancing 331 points (2.6 percent) and the S&P 500 rising 41 points (2.9 percent). Yesterday's market advance was attributed to Wall Street's expectation that the Federal Reserve will continue to cut short-term interest rates on Dec. 11 and on an announcement from Citigroup that the sovereign wealth fund of the government of Abu Dhabi, known as the Abu Dhabi Investment Authority (ADIA), injected $7.5 billion into the bank to strengthen Citigroup's capital base. Wall Street expects these rate cuts because Federal Reserve Vice Chairman Donald Kohn suggested that the Fed may need to continue lowering interest rates to provide needed capital to financially-strapped commercial banks and to avert a potentially worsening credit crunch. According to Kohn, "Heightened concerns about larger losses at financial institutions now reflected in various markets have depressed equity prices and could induce more intermediaries to adopt a more defensive posture in granting credit, not only for house purchases, but for other uses as well." Meanwhile, the ADIA decided to invest in Citigroup after the bank promised to pay authority a fixed annual coupon rate of 11 percent on the borrowed funds, payable quarterly, and to allow it to convert its investment into Citigroup's common stock at prices ranging from $31.83 to $37.24 per share over the next four years. Let me make sure I understand this: ADIA is able to buy Citigroup's common stock at an average price of $34.55 per share, and it gets an 11 percent annual rate of return on all borrowed funds not converted into the bank's stock between now and 2011. Sounds like Citigroup is having a lot of difficulty accessing the capital markets for needed financing. If the bank made a similar commitment to me, I would eagerly invest in the company's stock, especially after considering that Citigroup's stock is currently trading at a price-to-earnings multiple of only 8.4 and a book value of $25.48 per share. So, the facts behind yesterday's so-called positive news headlines were actually quite negative. And they weren't the only negative developments. For example, the National Association of Realtors reported yesterday that sales of existing homes fell in October to their lowest level in at least eight years. Loan restrictions and the prospect of further declines in home sales prices are deterring potential buyers. Also on Wednesday the U.S. Department of Commerce reported that orders for durable goods — things like home appliances, consumer electronics, and automobiles — declined for the third month in a row during October. This suggests that businesses expect economic growth to slow in the months ahead. Another very reliable leading economic indicator — bookings for non-defense capital goods (excluding the volatile aircraft sector) — fell for the sixth month in a row. Lastly, members of the Federal Reserve reported in their Beige Book of economic activity that economic growth slowed in seven of 12 U.S. regions during October through mid-November, with retailers "slightly pessimistic" about year-end holiday sales. According to the Beige Book report: "Most retailers said that they were expecting a slow holiday season, with only small gains in sales volumes compared with last year." Members of the Fed also reported continuing inflationary pressures, especially from rising energy and other raw material prices, as well as persistent increases in food costs. Just as I've been telling our readers, the Beige Book confirmed that "reports on retail spending were downbeat in general … [and that] most districts reported that retailers expect growth in retail sales to be modest at best relative to last year." In light of yesterday's negative economic announcements, you're probably wondering why stock prices rallied so sharply. The real answer is actually quite simple. The majority of risk-averse investors — those who had become concerned about the potential for economic conditions to worsen in the months ahead, and who were interested in protecting their investment portfolios from further declines — had already exited the equity markets. That left only bargain-hunting, bullish investors behind. In financial jargon, stock prices had therefore become "over-sold," that is, a lot of people sold shares, pushing prices down and creating a very short-term opportunity for bargain-hunters and traders. 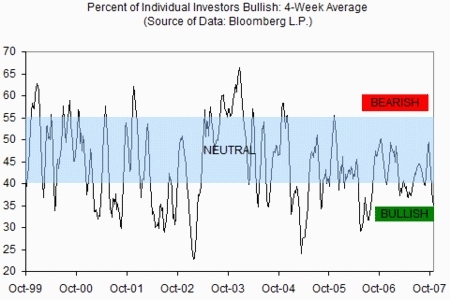 As you can see in the charts below, stocks tend to rebound whenever a small percentage of investors remain active in the market — the ones who are "bullish" — and when a large number of stocks has fallen to new 52-week lows. I strongly urge you to not get caught up in the hoopla. My investment models suggest that stock prices will continue to trend lower over the coming months. A vast array of economic statistics indicate that economic growth in both the U.S. and throughout many other regions of the world will slow considerably over the next six months and that inflationary pressures will persist. 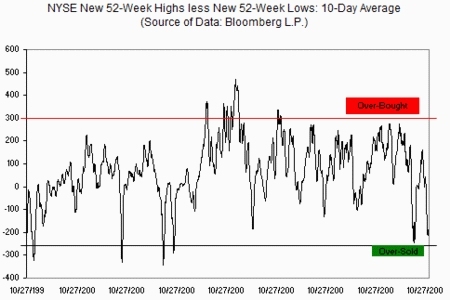 Historically, stocks have fallen during this type of environment. Go Here for more of David Frazier's market insights and investment advice - Get the 'Secret Code' today!